A friend of mine recently asked me to design an invitation for her childrens upcoming birthday party. The party has an active theme and she wanted something to reflect that. As I know both the children coming up with something to suit the party and the kids was not too difficult! They are both keen tennis players and the boy has recently discovered a talent for basketball. I divided the invite into two distinct sections and drew a tennis court on one side and a basketball court on the other. 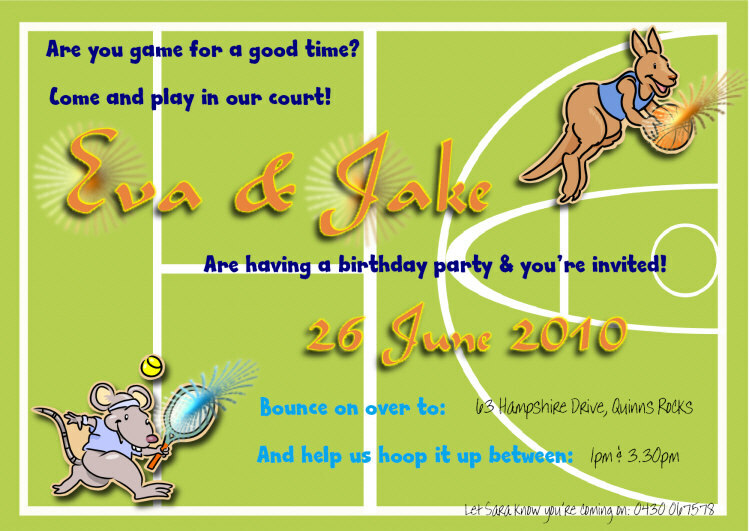 Inserted a couple of fun clip art characters and added some extra sparkle to give the invite a bit more ‘fun’. A couple of appropriate ‘sporty’ type words and the design was complete. As an extra embellishment you could always add some glitter glue after printing. Hope you have a fun party guys!